Add BWS to your favourites! 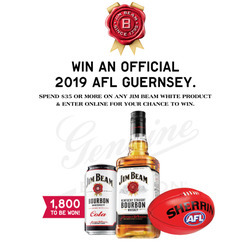 Spend $35 or more on any Jim Beam White product for your chance to win an official 2019 AFL Guernsey. Competition closes 07 May 2019. Need to get some moscato or pinot gris for a special night? Or maybe some cheap beer for a boys' night? Whatever the reason, BWS should be your first choice. Do you want to receive more offers from BWS by email?